Guadalupe is a volcanic island in Mexico, about 240km west of the Baja California Peninsula. The island’s population is just over 200, and that includes fishermen, some farmers and navy personnel. One of the most prevalent animals of the island are seals. Their population counts over 10,000 individually registered animals. The island’s elephant seals attract hungry great white sharks like magnet, and in return, these predators become the main attraction for brave divers who travel here to observe these magnificent creatures in crystal clear waters. Guadalupe is not your average diving site. You will not see colourful corals or huge schools of fish here, and you will not be able to take macro shots of the marine life either. You will not even need fins. 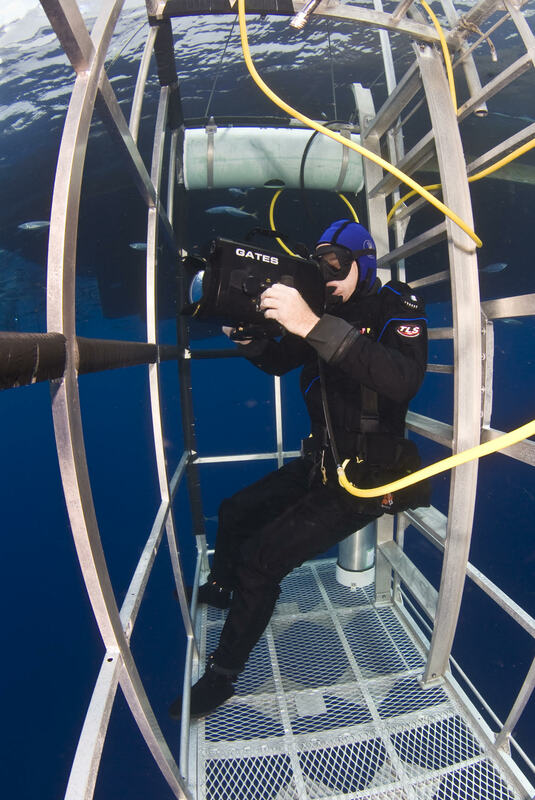 Guadalupe is about diving with great white sharks – in cages. There are 242! individual great white shark specimens that had been identified in the bay where divers are lowered into the ocean from the boat in cages. This is one of the best sites in the world to encounter these fantastic predators, from the safety of cages. 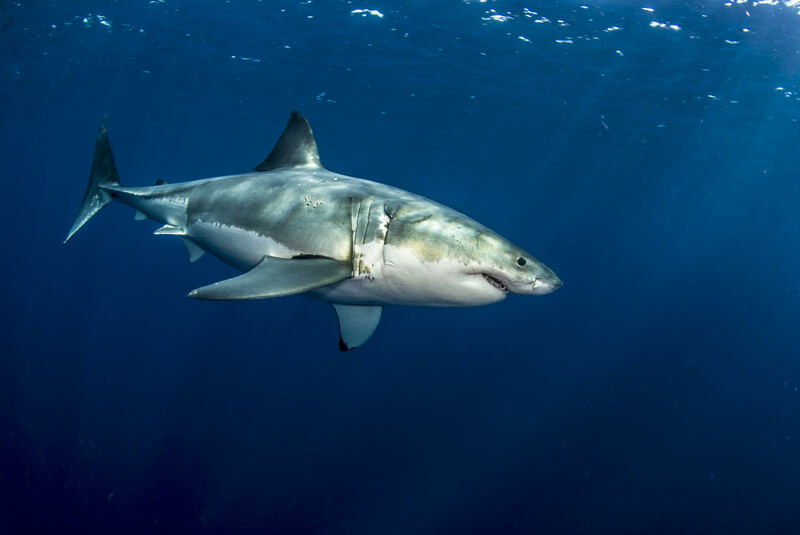 There are only a handful of sites on Earth where you can see great whites in such huge numbers and Guadalupe is one of them. Cage diving at this island could not be any better. 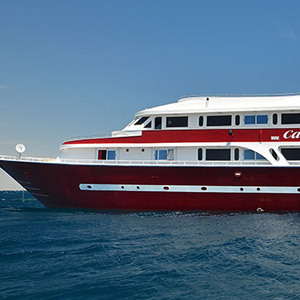 The pristine waters promise visibility of up to 40m or more! 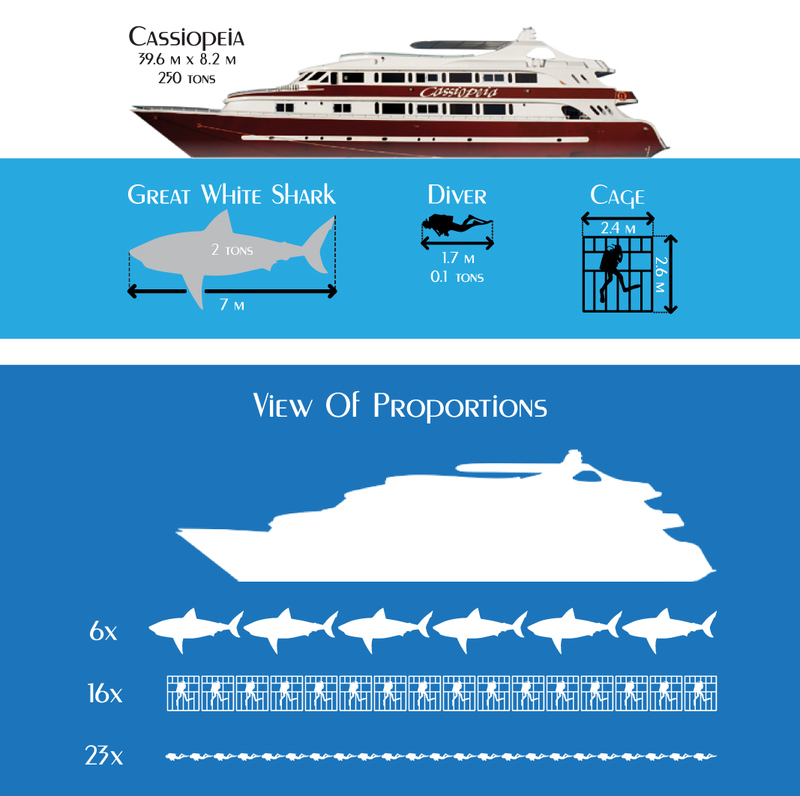 This explains why divers who love sharks travel to this site, for example to photograph great whites from up close. You do not even have to be a diver to live through this unforgettable experience. 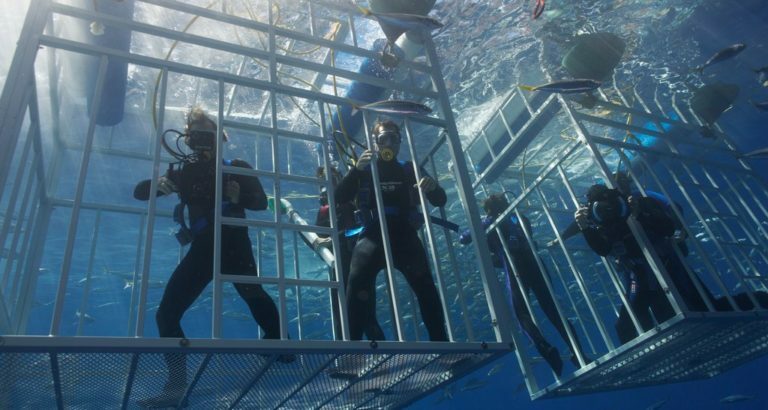 Non-divers will be lowered into the water inside the cages just to below the surface, breathing through hookah diving hoses with surface air supply, while divers will descend to 12m deep and marvel at the empire of the great white shark. 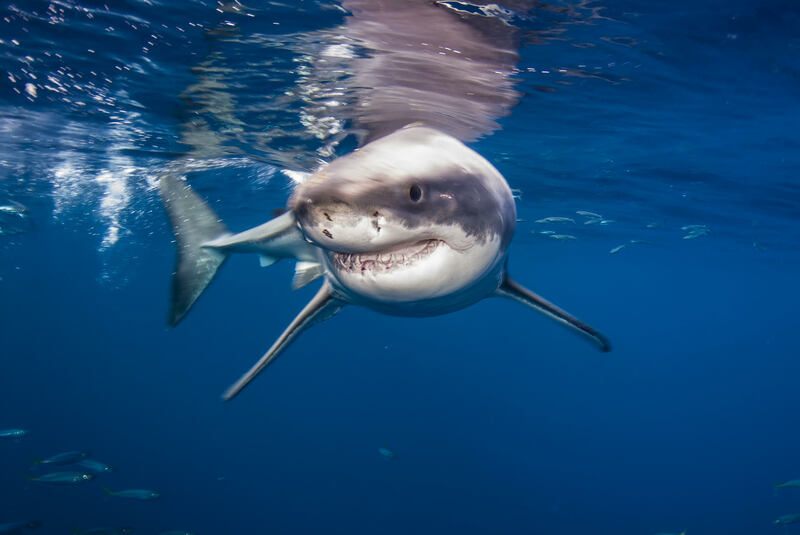 Why is the great white shark so special? It is one of the largest predators in the world. It grows to an average length of 4.6m but 6m-long specimens are not rare either. They are capable of swimming at speeds of up to 60km/h. The 300 sharp, triangular teeth grow in 7 rows in the animals’ jaws. They spend most of their time close to the water surface, and close to their prey which are lion seals, fur seals, whales, and other species of sharks. They are known to be loners and always on the move. At times they will peek out of the water with their heads above the surface to check out their surroundings, a rare behaviour that is representative of very few shark species. They are capable of leaping out of the water partially or even with their entire body as they cruise under the water at great speeds. This behaviour can be best observed when they are on the hunt for fur seals. The number of dives per day is not limited but divers must take turns to give everyone equal water dive. Water temperatures may be a bit cool, around 17-22C (63-72F), and it is a good idea to take breaks between dives to warm up. All dives are performed in groups of 3-4. The vessel is equipped with 4 diving cages. The length of dives is usually about 30-40 minutes. Hookah air supply (surface-supplied air) is used for the dives. There are no night dives on this itinerary. Usually the cages are immersed in the water to a maximum diving depth at around 12m (39feet) or divers may stay in the cage at the surface. Waters are crystal clear and visibility is excellent, more than 40m (131 feet). Currents are not very prevalent but may occur. Snorkelling is not allowed on this itinerary. 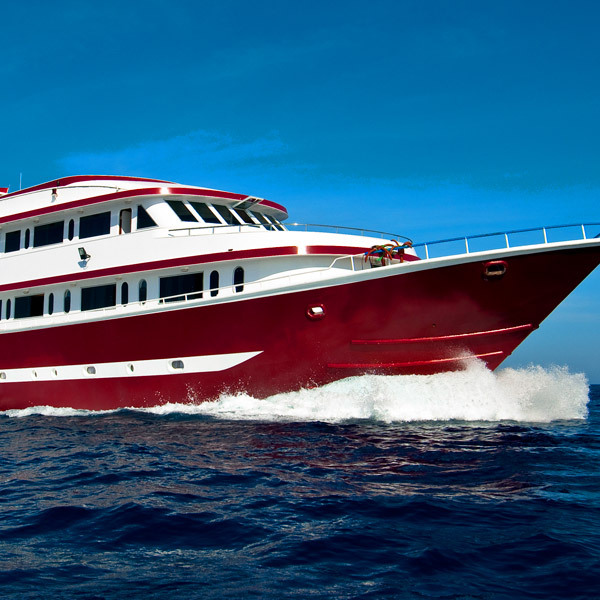 Passengers will be briefed by the guides before each dive. For further details, contact us at info@cassiopeiasafari.com !